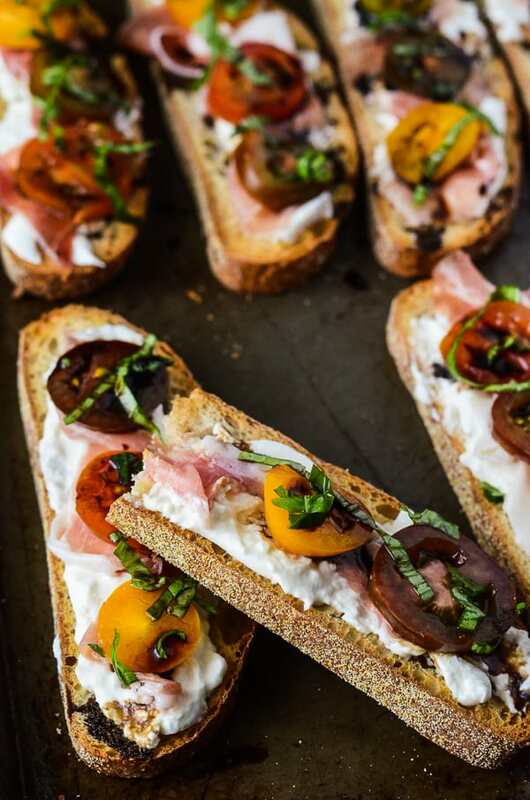 Burrata Caprese Crostini with Prosciutto ‪puts a creamy twist on a classic crostini – toasted ciabatta topped with burrata, prosciutto, mini heirloom tomatoes, basil & balsamic. I like to consider myself pretty adventurous with the foods I eat, but that hasn’t always been the case. Ten years ago, if someone asked me to try avocado, I’d wrinkle my nose in distaste. Sushi? Only if it was tempura and had no roe on it. Beef tripe?!? Get the hell out of here, I wasn’t eating cow stomach. All this food negativity coming from a girl who used to drink straight buttermilk with her Papa, and still eats liverwurst and sauerkraut to this day. JUST TAKE ME TO THE CAPRESE CROSTINI ALREADY! 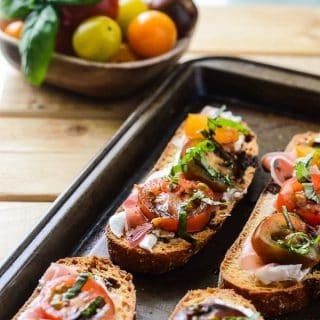 If you’d rather skip my (pretty darn helpful) tips and tricks, essential cooking info, and similar recipe ideas – and get straight to this deliciously easy crostini recipe, just scroll right on down to the bottom of the page where you can find the printable recipe card! Marrying in to a culture that is so different from what I was used to has been such a blessing. Abe has been more than happy to introduce me to plenty of tasty food I would have otherwise never touched. In turn, my eyes and taste buds are much more welcoming to trying new things. I really don’t know how I didn’t know about burrata. After all, cheese is an integral part of my life. I don’t feel complete unless I’ve had some sort of cheese at least a few times a week. Shredded. String. Ball. Pearl. Melted. Pizza. Stick. Whatever, it’s in my top ten foods made of milk, for sure. How I didn’t know that someone stuffed more cheese and dairy goodness into an already perfect ball of cheese…is simply beyond my understanding. When I stumbled across this Burrata and Garlic Tomato Appetizer, it was like a shot to my stomach. Cheese, tomato sauce, olive oil, garlic, and bread. One of the most primal and fun ways to eat – rip, dip, chew. Sometimes I think I’m actually Italian, and just got adopted into my German-Polski family. 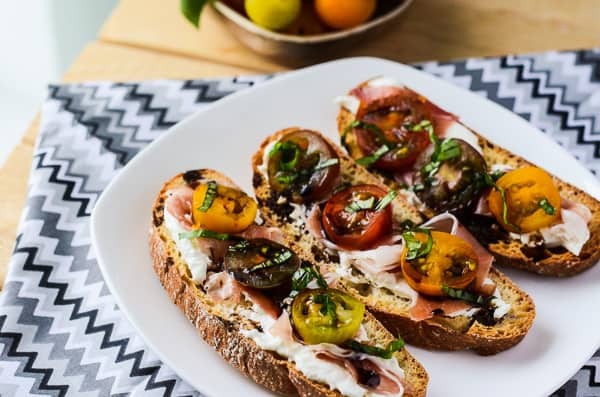 Burrata Caprese Crostini with Prosciutto ‪puts a creamy twist on a classic crostini - toasted ciabatta topped with burrata, prosciutto, mini heirloom tomatoes, basil & balsamic. In a small saucepan set over medium heat, bring balsamic vinegar to a slow boil, then reduce heat and simmer for 8-10 minutes until reduced by half. Remove from heat and allow to cool. Preheat oven to 350 degrees F. Place ciabatta slices on 1 or 2 baking sheets, and toast for about 5-8 minutes until crispy. Carefully slice burrata, trying to keep the creamy middle inside, and spread on to hot crostinis. Layer prosciutto on top of cheese, then place 3-4 tomato slices. Sprinkle each with basil ribbons, then drizzle with reduced balsamic. Burrata is my favorite! 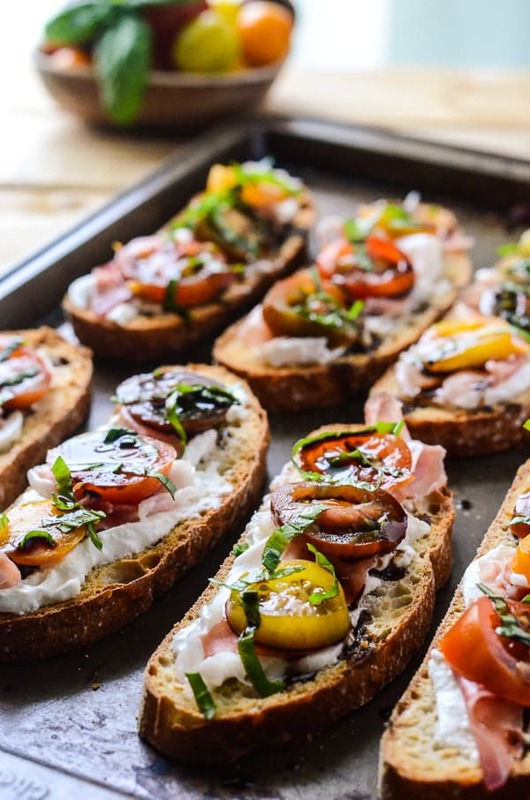 I especially love it with fresh summer tomatoes and prosciutto….yum! If you are having liverwurst and sauerkraut, I’ll join you. Seriously….I love them both. Oh, these look like little bites of heaven right here! 🙂 And Happy Birthday to Isabel! I had the pleasure of meeting her at the Food & Wine Conference a few weeks ago. Awww “Mama Isabel” <– I love that! I'm so glad you've ventured out with your culinary tastes! I don't think I could live without sushi. 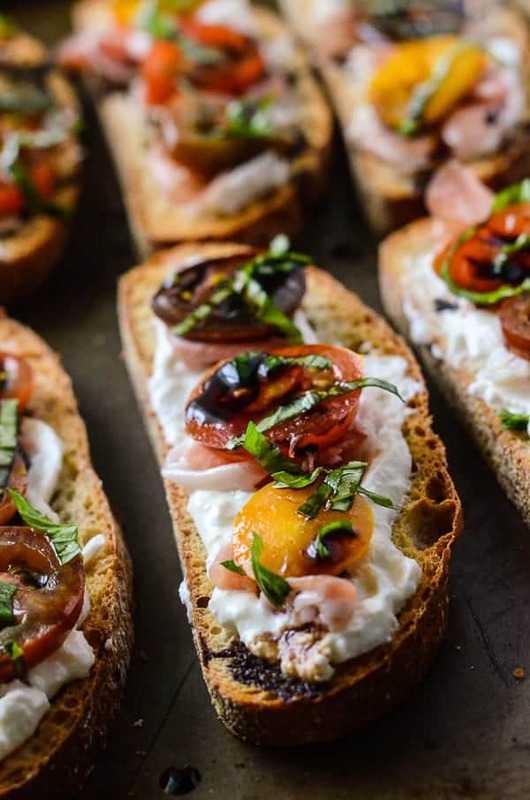 I could totally go the rest of my life without eating tripe 😉 This burrata caprese crostini is ridiculously delicious and absolutely perfect for Isabel's party. Plus, your photos are gorgeous! What a gorgeous, gorgeous appetizer! So fun that you made it in honor of your friend’s birthday! Love how we’re inspired! These look so good. Such wonderful summer flavors. I know, right! I am on the lookout for Burrata all because of Isabel! 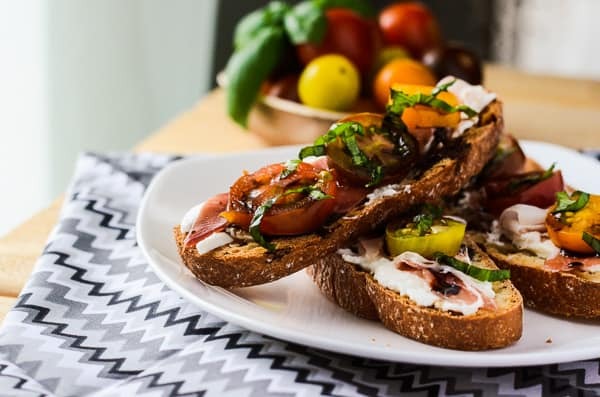 Your appetizer looks absolutely delicious and gorgeous photos! These are beautiful! And now I’m wondering why I’ve never had burrata! That really needs to change! Beautiful photos! My mouth won’t stop watering, yum! Oh my this looks amazing. I must remember to use the vinegars more often. I can’t have dairy but I sure can substitute goat cheese on a slice for myself! I prepared a crostini for #IsbelsBirthdayBash too. Great minds think alike, eh? 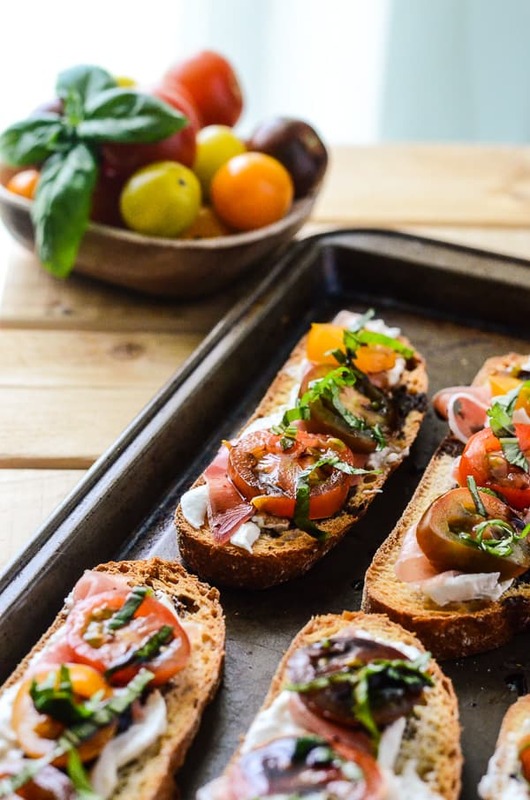 These crostini look and sound absolutely delicious! Like you, I had a lot of food dislikes… and then proceeded to start a food blog and realized I actually like a lot of different stuff I thought I never did. Go figure. Buratta is one of my favorite cheeses. So darn good. And I bet these crostinis are perfect! Okay, first of all I’d wrestle Isabel to the ground over these crostini. Oh my. Carry on with the sauerkraut and liverwurst. Those are 2 things everyone must eat. Have I mentioned I am half German? Oh yum! 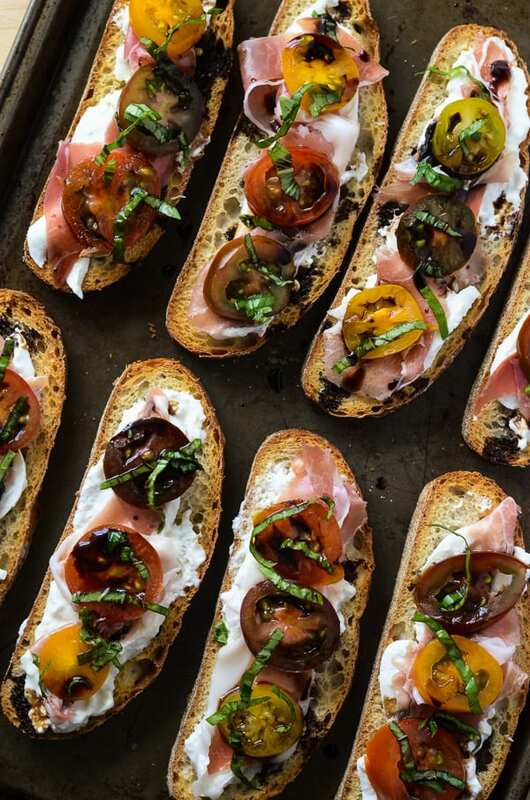 These crostini look soo good! And gorgeous photos! This post made me smile, made me giggle and truly just bust out laughing as I continued to read. You are the best and I am just so glad you are no longer a burrata virgin. That’s just not right. I loved meeting you at the Food Wine Conference and I am so honored you were part of my birthday celebration! Thank you for making my birthday SO special. You rock! This is SO Isabel. I love crostini and I’m sure this combination was truly delicious! You can be adopted into my Italian family 😉 Thanks for participating!